This “cake” turns a few simple ingredients into a satisfying meal. 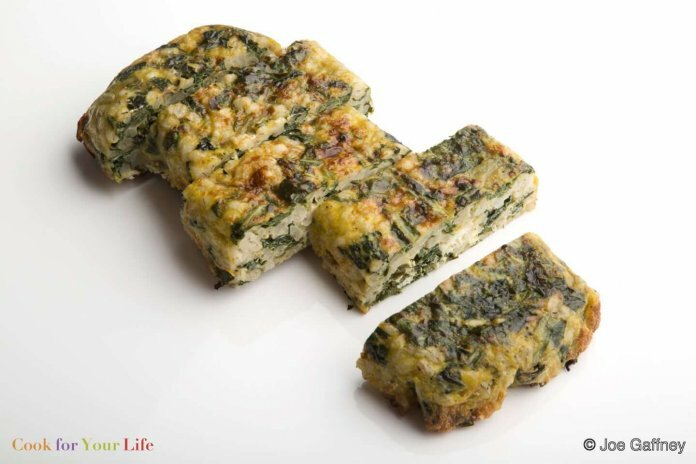 It’s layer of goat cheese in the center that makes us think of this as a cake though, I guess technically it’s a frittata. No matter, it’s an ingenious way to repurpose cooked grains, in this case barley, while getting the benefit of some cancer-fighting kale. If you’ve not the energy to prep the kale, substitute chopped frozen kale for fresh to make things go even quicker. Easy and delicious. 1. In a wide sauté pan, heat 1 tablespoon of olive oil over medium heat. Add the garlic, shallot and rosemary and cook until the shallots are golden. Add the kale and pinch of salt and cook, stirring, until softened about 5 to 8 minutes. Turn off the heat. 2. In a large bowl, lightly whisk the eggs. Add a generous pinch of salt and pepper. Stir in the sautéed kale and barley. 3. Heat the remaining tablespoon of olive oil and lightly grease an 8-inch cast iron skillet or other oven-safe pan. Pour in half of the egg mixture, then sprinkle with half of the goat cheese. Pour in the remaining egg mixture and top with the remaining goat cheese. 4. Cook over medium-low heat on the stovetop until the egg has begun to set. Then finish cooking under a broiler for 8 to 10 minutes until set and well browned. 5. Let cool for 3 to 5 minutes then serve warm or at room temp in wedges. You can use leftover barley for this recipe. If you have to cook it from scratch, bring 1 cup of barley and 2½ cups of water or broth to a boil. Reduce heat and simmer, cook covered until tender and most of water has been absorbed, about 35-45 minutes. Turn off the heat and let steam for 5 minutes. Makes 3 to 3½ cups.